Knights Ferry is a fantastic place to start your day in the sun, and whether you are rafting, kayaking, hiking, or picnicking, there are plenty of options to keep you, your friends, and family busy! Knights Ferry Recreation Area is the starting area for one the most popular floating trips in all of Northern California. This mild (but gorgeous) section of river from Knights Ferry to Orange Blossom Park spans 7 miles, contains class I and II rapids (so is beginner friendly) and offers scenes of volcanic bluffs, the Sierra Nevada foothills, and offers access to multiple public parks where groups can stop and picnic. Self-guided trips start around $30 per person for the day and include paddles, life jackets, and a shuttle ride back to your car at the end of the trip. For more information check out Sunshine Rafting Adventures in Knights Ferry, or give them a call at 209-848-4800. Both rafting and kayaking trips are available. Knights Ferry is a great place to explore on your feet! From the downtown area, which features about 3 blocks of shop-centric strolling, to the Recreation Area, which contains a 1.5 mile loop, there are plenty of places to get out and stretch your legs! 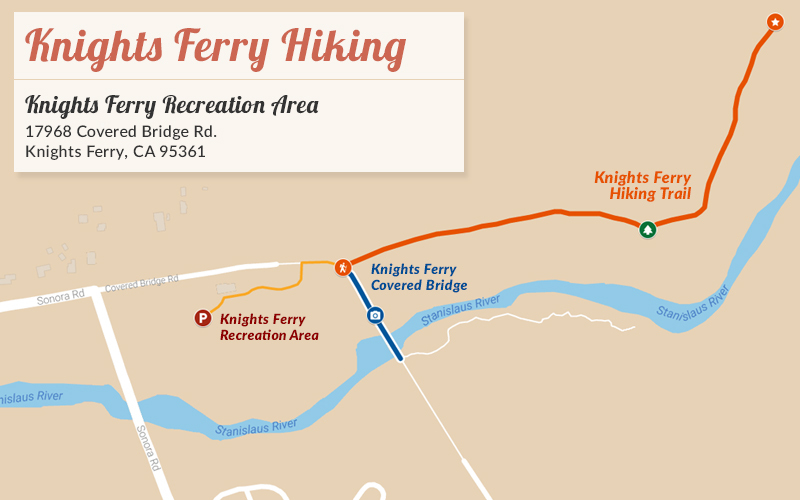 The most popular Knights Ferry hiking trail starts at the Knights Ferry Recreation Center and winds east past the covered bridge toward the Stanislaus River gorge. This trail, which is beginner friendly and made of compacted dirt, is a great way to see the natural beauty of the foothills while getting perfect views of the Covered Bridge. Feel free to bring your dog along, but please remember to bring a leash. In the mood for a day out in Knights Ferry, but looking to relax to the max? Knights Ferry has multiple areas where you can set up shop for a picnic or BBQ with family and friends! The Knights Ferry picnic areas have BBQ stands, so you just have to bring tin foil, coals, and food, and you are all set! Many of the picnic areas in the Knights Ferry area also have space to play and relax, so feel free to bring a Frisbee out and enjoy the beautiful Knights Ferry park system! Also, be aware that although most people choose to picnic close to the Information Center, there is a large extension to the park directly across the river from the Information Center. This extension can be reached by leaving the Information Center Parking Lot, crossing the bridge, and taking the first left into the paved lot.